Introducing: ArtScroll.com Loyalty Program and Double Points Special! ArtScroll.com‘s new loyalty program is simple: earn reward dollars in three easy steps! You earn 1 point for every dollar you spend at ArtScroll.com or by phone at 800-MESORAH. For every 200 points you earn, you are eligible to receive a $10 reward coupon towards a future purchase. From time to time we will run special promotions where you can earn extra points, giving you the opportunity to earn even more reward points! You can always check your point balance by logging into your account at ArtScroll.com and viewing your current points total on the right side of the header. During check out there will be an option on the payment page to redeem your rewards. When you are logged into your account, your point balance will appear on the upper right hand corner of the site. Click the link and there is a button on the page to redeem your points. This reward coupon will be applied as payment towards your order. One Week Special: Earn Double Points! That’s right! 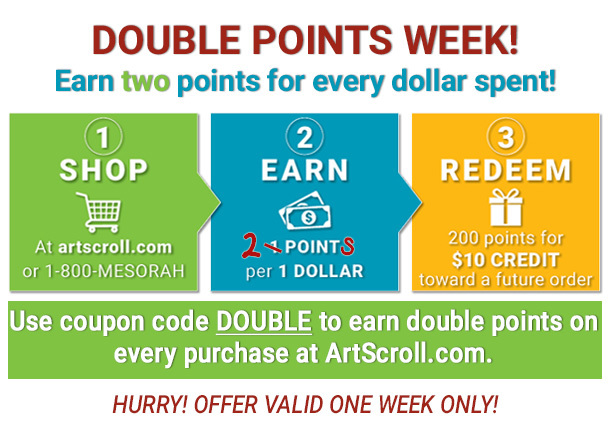 For just this week, you can earn TWO points for every dollar you spend at ArtScroll.com! Bonus offer: Not an ArtScroll.com customer yet? Sign up today and get 25 bonus points automatically added to your account! Click here to view all loyalty program terms and conditions.Double points offer expires midnight on Sunday, Novermber 1st.